This session marked the fourth segment of our Getting to know the Holy Spirit series. 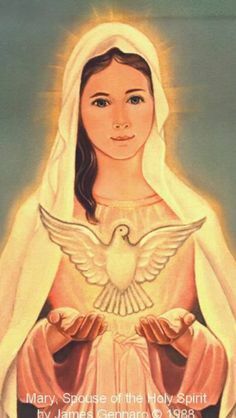 The Wild Goose episode- The Spirit and Our Lady, focused on encountering the Holy Spirit and saying yes to God’s will; Father Dave Pivonka, explains that we too can experience the power of the Most High by surrendering to His will and having the grace to go through it by an overshadowing of the Holy Spirit. We ended with a tailored discussion based on pre-set questions and a reflection; keep reading for the juice! Mary displayed that in the midst of brokenness, we can be made whole. Rather than contemplating the consequences of what an inexplicable pregnancy would do to her relationship with Joseph and impending shame from society, she took a step that would affect the whole of mankind. It can be said that she was not overcome by “Holy fear” by dwelling in the gravity of her commitments but focused on the feelings of grace, peace and joy. A person who gets cold feet on his/her wedding day does not necessarily feel altered emotions, it could be Holy fear as they are afraid and consider their readiness for this next stage in life while making a commitment to God, in His presence. Mary was chosen by God because the process of making the Word ‘Incarnate’ involved using a pure human vessel to give birth to Jesus, just like each and every one of us was born. While this exchange occurred, Elizabeth’s unborn child (John) leapt for joy in his mother’s womb. The Angel Gabriel also declares to Zachariah that John will be filled with the Holy Spirit even in his mother’s womb. This goes to show that the Holy Spirit can come upon unborn babies in the same way as adults. Therefore, it can be deduced that unborn babies have souls and should be accorded the same rights as adults to uphold the dignity of a human person. After Jesus went up to heaven, the disciples went up into the upper room along with Mary, the mother of Jesus and with his brethren to pray (Acts 1: 14). Mary’s presence was instrumental as she had already experienced the feeling of being filled; her presence was like that of a spiritual chaperone to the disciples as the day of Pentecost approached. 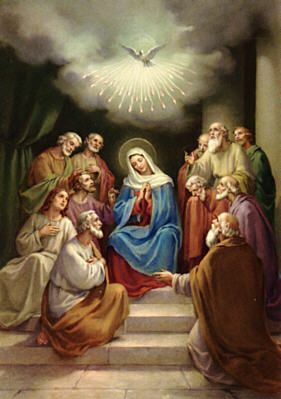 Pentecost represents the day that God decided on their readiness to receive the Holy Spirit and manifest his gifts, hence their ability to speak in tongues and perform other deeds. However, our idea of living life in the spirit involves being faithful every morning with small tasks so that we can graduate to performing bigger tasks. Its pertinent that we go through our personal journeys without prematurely taking on a spiritual assignment as we may not be ready. This may prompt us to ask ourselves if there are things we need to let go of in order for God’s will to prevail. We should look to Mary as an example as she let go of her son, Jesus, at the wedding in Cana to begin his life in ministry. Reading this chapter, we can learn lessons from how Mary lived her life and the fact that everyone she interacted with accepted the Holy Spirit’s prompting. Mary had free will to accept or reject her special assignment but her rejection would not have laid the foundation for John’s and Jesus’ birth. As a child, she had been aware of the coming of the Messiah and so her fiat led her to the Cross, the empty tomb and to the upper room where she was once again overshadowed with the Holy Spirit. When we read these texts, it becomes clear that God had a plan and he uses various people who submit to the Holy Spirit, to bring forth his plan. How is it apparent that God has a plan for your life? God’s masterplan is to bring forth his kingdom and it is left to us to be a part of that plan or not. This is why we all have different gifts to use as tools for the betterment of mankind and the expansion of the heavenly kingdom. We may not have a whole plan written out for us but with discernment, we are given a revelation of the next step upon completion of the last. Ultimately, God created us for an everlasting relationship with Him: to know, love and serve Him in this world and to be happy with Him forever in the next. How has God used you to bring about his plan in other people’s lives? This question brought to light that our ideas are the seeds which have been planted by God in our hearts and our gifts and talents are the tools with which we nurture these seeds. Like the parable of the talents (Matthew 25: 14 – 30), we will be asked to give account of how we used our own talents to the betterment of other people’s lives and ultimately, His kingdom. A continuous prayer to discern our next step is required so that we may act in faith and our ordinary work bring forth extraordinary results. Everyone goes through different spiritual journeys but it is important not to dwell in the feeling of Holy fear and allow ourselves to be overcome by the goodness of living life in the Spirit, just like our Lady. Have you reached that point in your journey that you feel spiritually saturated but don’t know how to share your personal discoveries? That may be a cue to embark on an “Upper Room” experience just like the disciples. It will do us a lot of good to be spiritually ready for the work of God and take direction from Him. Mary had been preparing all her life by learning Scripture in the temple as a child and the disciples could count on the time they spent with Jesus and their special preparation in the Upper Room. This shows us that when God feels it is time for our special assignment, He prepares us by sending the Holy Spirit to overshadow us. It’s one thing for us to accept a special assignment and another to prepare for it. Have you welcomed your Upper Room experience? Maybe it’s time to say yes to being an active member of Christ’s body in the best way you can: volunteer at church or an orphanage, help your brother train for his sports competition, share your inspirational poetry to uplift others or visit the sick. Our focus of living our lives like a gospel that others may read may not always be the specific task or size of the task, but the manner in which we approach it and the demeanour in which we carry out the task.